Absence touches a part of our lives for which few of us want to confront until necessary. Psychologist Erik Erikson articulated his Psychosocial Stages over fifty years ago, but we have been struggling to live and die for centuries. At the end, we are faced with the eighth stage, a bitter reflection on our life and its purpose: ego integrity vs. despair. While Erikson focused on persons over sixty-five years old reflecting on their accomplishments or feeling a sense of despair, I argue that Absence provides an additional quandary and dilemma for our aging population: What if I do not and cannot remember what I have accomplished? Even more simply, what if I cannot connect in a world which is increasingly out of my control? Such is the emotionally tumultuous journey for our protagonist. I had the pleasure of seeing Kippy Goldfarb tackle the demanding role of Helen; Goldfarb is Joanna Merlin’s understudy, and you would never know. Much of her strength lies in her ability to convey confusion while struggling and fighting to keep her consciousness. This beautiful internal struggle manifests itself in her relationships with her daughter Barb (played with no-nonsense but warm Anne Gottlieb) and Helen’s husband David (played with yearning sincerity by Dale Place). Playwright Peter M. Floyd does a wonderful job of dissecting and exploring the many daily struggles of living with dementia, and living and loving someone who struggles with such illness. 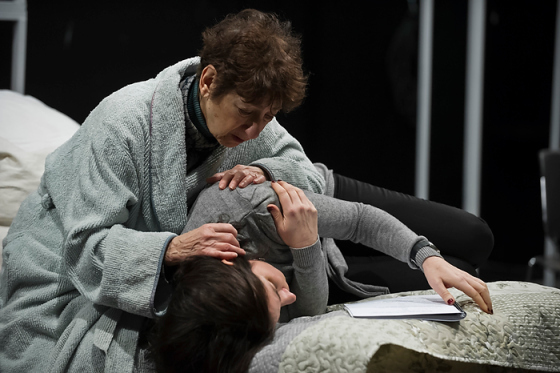 From repeating conversations to forgotten memories to crushing reminders of what is no longer there, the audience goes on the emotional rollercoaster with Goldfarb’s Helen. One of the play’s strengths is its ability to confuse and resolve, and then confuse again. Like Helen, the audience never knows whether we are seeing reality or fiction, truth or lies, and we trust no one in this fractured tale. From the opening monologue, I trusted and believed in Goldfarb’s Helen; the actress is incredibly endearing and welcoming and her struggles became empathetic and sincere. Goldfarb’s Helen is harsh but she infuses enough humor to compensate for her deep emotional resentment and confusion. Gottlieb’s Barb is demanding, but she enriches her role with sensitivity which shows her genuine care for her ailing mother. My one complaint for Floyd is avoiding a very real subplot for Barb: Will she become her mother? This struggle would give her more emotional range and choices, and create a story with which younger audiences can identify. I had to acclimate myself to Place’s David; his emotional resonance and resiliency did not ring true until he heightened the urgency and conflict with his fights with Goldfarb. Indeed, the moments of struggle for the characters desperately grabbing onto whatever sanity, memory, and integrity that they could hold rang truest for me. Director Megan Schy Gleeson does an outstanding job of orchestrating these scenes, creating beautiful stage pictures and variety, not afraid to let the rawness of the moment compel characters to do and say outrageous and passionate things. Nothing felt safe in the relationships between Goldfarb and Gottlieb, and Goldfarb and Place. And that is how I like my theater. Unfortunately, I cannot give the same praise to Beverly Diaz’s Samantha, Helen’s granddaughter. Though a college performer, she felt like she could not convey some of the character’s age and demeanor without resorting to temper tantrums. The role requires some substantial maturity, especially in a particularly emotionally-charged scene between Samantha and Helen. Diaz presents some of her strongest choices here, but they never feel like enough. Her emotional journey with her grandmother feels the weakest, and as someone who lost a grandparent to dementia in my early teenage years, I can relate to Samantha’s struggles and I wanted more from Diaz. Perhaps the writing just isn’t there to make this journey and relationship as palpable as the others, but I think a story deserves to be told about Samantha’s need for her grandmother to continue to fight and Samantha’s desire to learn and know more about this interesting and absent woman in her life. Equally perplexing was Bill Mootos’s Dr. Bright, a fictitious quack of a doctor who appears only in Helen’s imagination and fantasy. Their conversations are poignant and offer some of the strongest “themes” and “ideas” but never develop into truly exciting theatre. Perhaps Mootos is too outlandish; perhaps we are never clear what Dr. Bright needs from Helen. Imaginary characters or ghosts offer some of the most complex problems for playwrights, starting with Shakespeare’s Hamlet. Without the character have a clear goal, he or she becomes a mere plot point for interesting conversation which expands beyond the possible and into the fantastical and metaphysical. While such plot devices are fun and interesting, they are not good theatre, and instead become old tricks, tried and failed by many playwrights. I think Floyd is better than that, and I encourage him to revisit this character to give him a “new life” in the play while keeping much of his focus. The technical elements are dazzling in the small intimate space of the Boston Playwrights’ Theatre. With opaque glass doors which slid with ease and curtains zooming across the stage, the stage transitions seamlessly through reality and fantasy, time and space. A nice touch is the use of the boxes at the front of the stage which periodically are removed by the cast, which create a dizzying array of movement, a clever metaphor for Helen’s loss of memory and the chaos of her life. The boxes are never opened, the contents feel almost weightless. Such is the beautiful of memory and the painful loss of it. Absence is not for the emotionally weak. Few of us have to struggle to remember what we had for breakfast, our telephone number, or whether a loved one has died. Yet, for those of us who worry about family and friends who may experience this disease, this play offers a haunting reminder of the tragedy facing a growing population all over the world. Floyd and Gleeson’s cast does a phenomenal job of creating a real story which could affect any of us, at any moment. For this, I thank them. Don’t miss Absence at the Boston Playwrights’ Theatre from now until March 2, 2014. This is one show that you won’t forget any time soon.